1 of 6 Heat oven to 350 degrees . Coat 2 large baking sheets with cooking spray. 2 of 6 In medium-size bowl, whisk together flour and salt. 3 of 6 In large bowl, on medium-high speed, beat together butter, sugar and extract until creamy, about 2 minutes. Stir in flour mixture, nuts and pineapple until dough forms. 4 of 6 Divide dough into 6 equal pieces. Roll each piece into a ball. Place 3 balls on a prepared baking sheet; flatten each into 5-inch round. Smooth edge; press tines of fork around edge. Cut each into 8 equal triangles; do not pull apart. Repeat with remaining dough and second baking sheet. 5 of 6 Bake in 350 degrees oven for about 15 minutes or until just lightly golden. 6 of 6 While still hot, recut rounds into triangles. Transfer to rack; let cool. 1 of 1 In small bowl, stir together sugar and juice until smooth. Divide icing in half; tint half with red food color. Spoon each icing into a pastry bag fitted with a small writing tip. 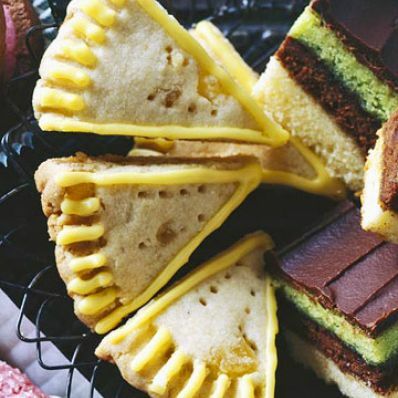 Pipe alternating stripes into indentations on each cookie. Let dry.